Competition for business and budgets appears to be greater than ever. Doing ‘more for less’ is a common request from customers and proving services have been delivered as a business benefit can be difficult for suppliers. Even for business-critical systems (including safety-critical and mission-critical systems), suppliers are under pressure to use techniques and tools that will deliver a better solution for lower lifetime costs, whilst not compromising on quality standards which might be catastrophic for a business’ bottom line and severely affect safety. It is fair to say that the automotive industry has been very successful in integrating software systems for many decades. In fact, systems like traction control, ESP and ABS have dramatically improved the performance and safety of vehicles over many years. However, recently, on quite a few occasions, safety issues in the software of road vehicles have made the news headlines resulting in vehicle recalls that have damaged the industry’s reputation and cost it millions of pounds. ADVANCE is a European-wide initiative between industry and academia to lead the future development of high-quality embedded systems in a more cost-effective way. The approach followed by ADVANCE supports the verification and validation of requirements from the very initial stages of system design. 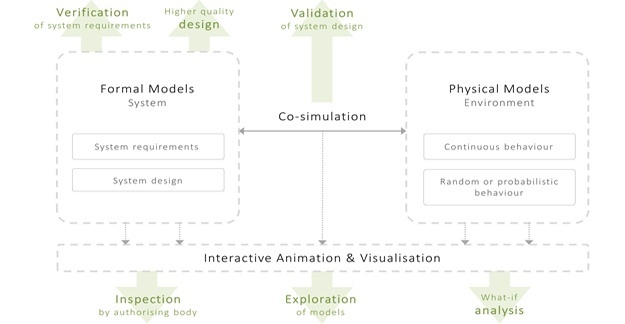 Validation of the requirements is supported through simulation against environmental models (i.e. model-in-the-loop validation). The verification results are ensured to be trustworthy and unambiguous due to the use of mathematical-based modelling and proof. Test-Driven Development (TDD) is an evolutionary and iterative method that is an alternative approach to software development. Whereas in traditional approaches tests are written retrospectively, after the code they are designed to test, TDD reverses this approach by first writing the tests and then the code intended to pass them.